If you fail to generate targeted traffic to your site, you won’t make sales. For only $30 you will get guaranteed 300- 500 daily visitors daily to your website, blog or landing page for 180 days or 6 MONTHS. This Gig is completely different from others because I will be using 100% white-hat technique to drive traffic to your links. ✓ Secured against Google updates. 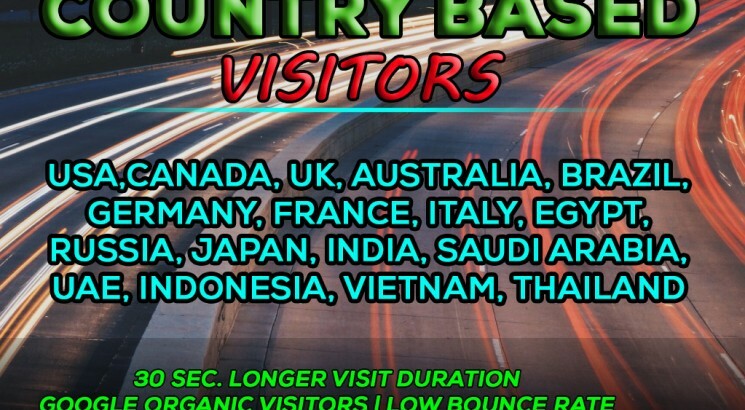 Visitors mostly come from Top countries including USA, UK, CANADA, AUSTRALIA, MEXICO, GERMANY, FRANCE, IRELAND, ITALY, NETHERLANDS, RUSSIA, EGYPT, INDIA, INDONESIA, THAILAND, IRAN, PHILIPPINES, PAKISTAN, UAE, SAUDI ARABIA, etc. You will get sales/leads/opt-ins IF and only IF visitors are interested in your products/services. There is no guarantee of automatic sales with this service.